Ladue Schools. 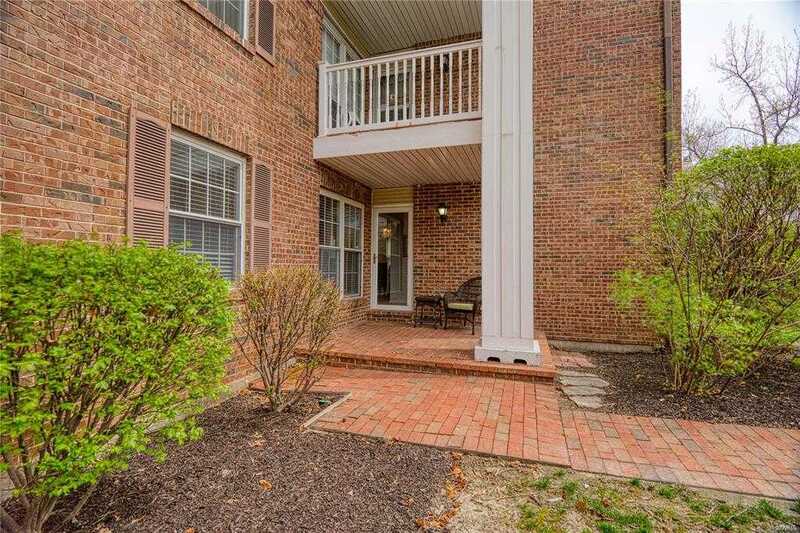 This is a rare 3 bed 2 bath main floor end unit with its own private walkway, patio and entrance. Great place to entertain in 2244 sq ft! Spacious family room, & an elegant den/library with special woodwork and wood-burning fireplace. Living room has crown molding, chair rail and wet bar. Coffer ceiling in the separate formal dining room . Kitchen has nice light with a pantry, built-in microwave, trash compactor, double-sink, smooth cook-top, and an adjacent breakfast room. Laundry room is off kitchen. The washer, dryer, refrigerator are included in the sale. Master bedroom suite has 2 walk in closets with master bath. Additional 2 bedrooms and hall full bath. Secure building with elevator to an assigned garage space and a storage unit. Across the street is the pool and club house. Additional guest parking right out front. Outstanding Ladue Schools: Spoede Elementary, Ladue Middle, Ladue Horton Watkins. Duplicate listing of 19025392.